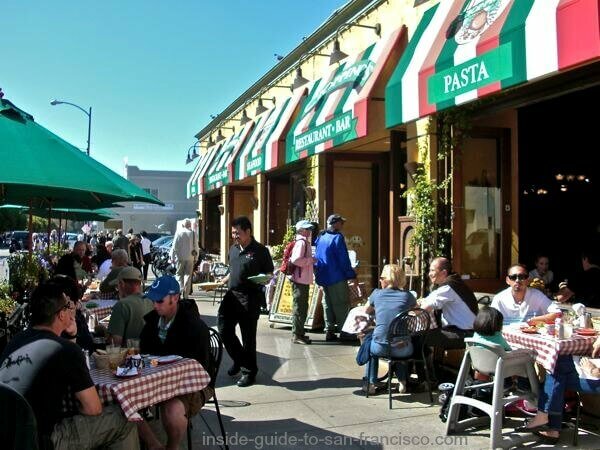 Fisherman's Wharf San Francisco: a local's review. 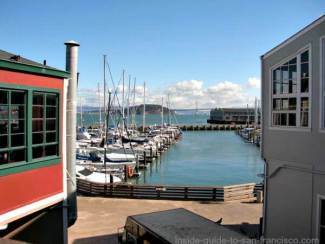 A local's tips on the best things to do at Fisherman's Wharf! Fisherman's Wharf is the most popular San Francisco attraction. Then why do the natives avoid it like the plague? 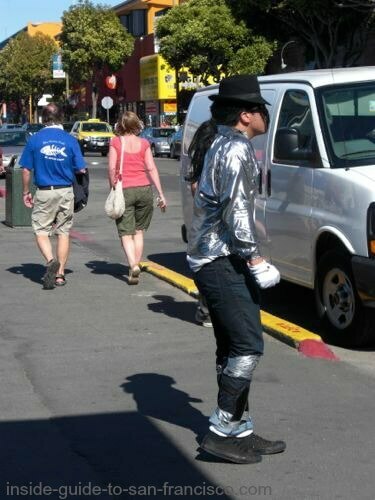 This place has some kind of magnetic effect on our visitors that has us San Franciscans scratching our heads. We only come here when we have guests from out of town who drag us down here. But there are so many people from all over the world really love Fisherman's Wharf. What's the truth about this place? Originally Fisherman's Wharf was the dock where the Italian fishermen brought their daily catch to be sold on the waterfront. This was the best place to get fresh seafood, right out of the bay. Clams, oysters, mussels and many different kinds of fish were brought in on the small fishing boats to supply the residents with food. Part of the catch was boiled, grilled or steamed right here on the wharf for hungry citizens. And that part is still true. You can still enjoy some great fresh seafood at the stands along the wharf. Clam chowder, crab legs, steamed mussels, just pulled out of the water...delicious! Fisherman's Wharf has become a playground for tourists, and that's OK. The tacky T-shirt and souvenir shops are there, of course, but there's also a lot of really fun things to do. The wharf area has a festive atmosphere that is rather contagious and I've actually been having a great time doing "research" for this site! 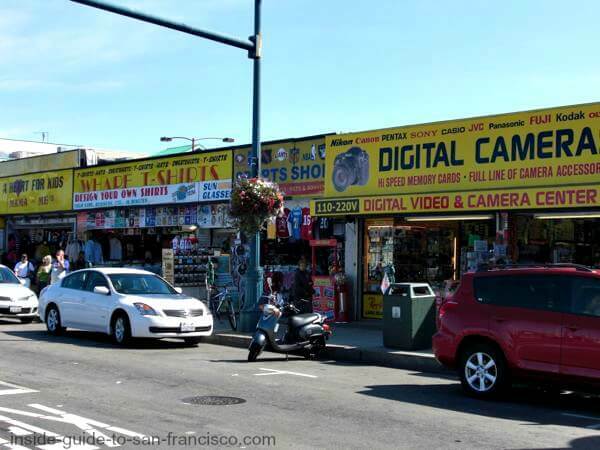 Pretty much everything is located along a few blocks of Jefferson Street, the main drag of Fisherman's Wharf. There are rows of stands where you can buy fresh seafood - crabs, fried fish, mussels, and more. Keep an eye out for the thieving sea gulls if you walk around with it. 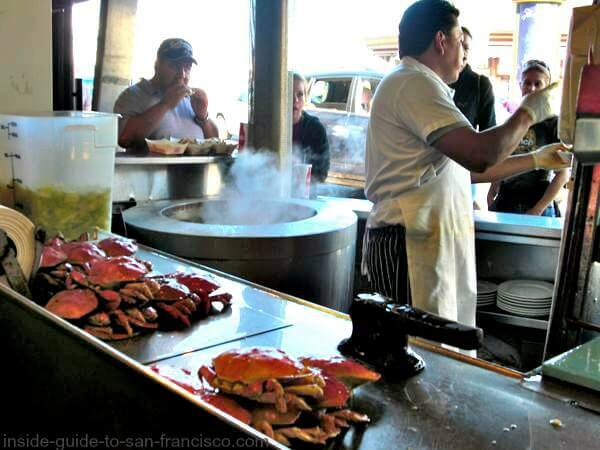 Best time for eating crab: during the Dungeness crab season, November through February locally. All of the crabs are males (harvesting female crabs is illegal and it's strictly enforced). You wouldn't think restaurants geared for serving large large numbers of tourists would be very good, but there are actually some with excellent food. Cioppino's, serving a delicious version of their signature dish, cioppino (seafood stew in a tomato base). I had the best polenta I've ever had there, and the spaghetti carbonara was wonderfully rich and tasty as well. With a relaxing seating area al fresco on the main drag. 400 Jefferson Street. Lou's Fish Shack: (which doesn't look like a shack at all) also has very tasty food, in spite of catering to large numbers. There's an outdoor seating area for people-watching, and friendly, fast service. The fish tacos are delicate and wonderfully seasoned, and the beer-battered fish and chips are very fresh. 300 Jefferson Street. Alioto's: old-school Italian (actually Sicilian) seafood restaurant. A San Francisco icon, over 90 years at the wharf. Family run for four generations. Good service, decent seafood, somewhat expensive, and they have a pretty view of the marina and bay. The elegant, old-time restaurant is upstairs (they also have a casual cafe on the ground floor). They were the first, two-story building on the wharf in 1957. Entrance is located on the main Fisherman's Wharf square near the big sign. Off Jefferson St. at Taylor. Open daily, starting at 11 am. 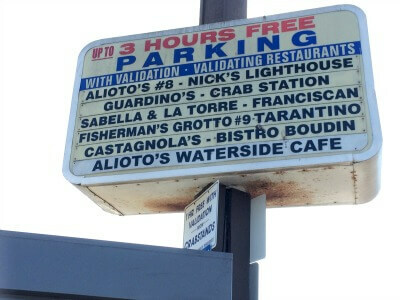 Alioto's validates parking for the Triangle Parking Lot at Taylor and Jefferson, the lot right in front of the building: 2 hours free before 6 pm, 3 hours free 6 pm till midnight. These are great fun: a perfect way to see the bay, sail out under the Golden Gate Bridge and around Alcatraz Island. One of my favorite things to do at the wharf. Both the Red and White Ferries and the Blue and Gold Ferries leave from piers at Fisherman's Wharf, as do the small fishing boats. A number of boat rides and bay cruises leave from Fisherman's Wharf. Tip: Goldstar often has half-priced tickets for many of the bay cruises and other SF activities. Check with them first before booking a tour. It's free to sign up, then you can see what's available. See goldstar.com. Rocket Boat. High speed, rock and roll, 30 minutes of zooming around the bay. Go under the Bay Bridge, and past Oracle Park. $28. Runs May through October. See Rocket Boat. For lots more information on the boats and tips about getting out on the water, see my page on SF Bay Cruises. 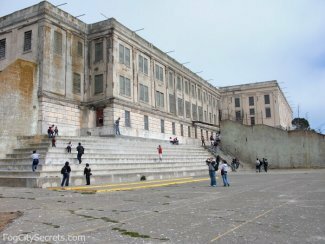 If you want to take the Alcatraz cruise where you get off the boat and explore Alcatraz prison, see my suggestions on visiting Alcatraz. 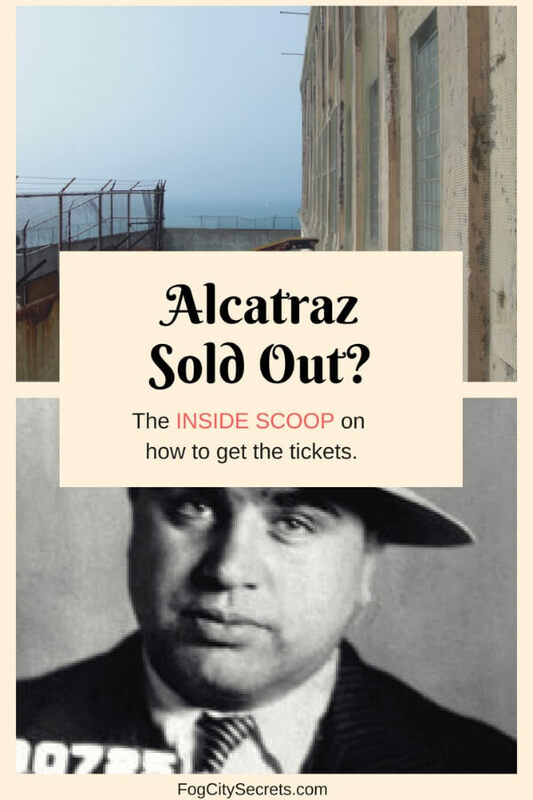 Alcatraz sold-out? Fear not. 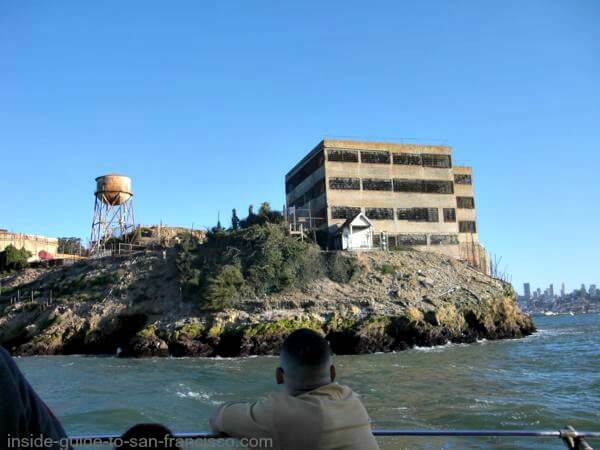 See how to get last-minute Alcatraz tickets. 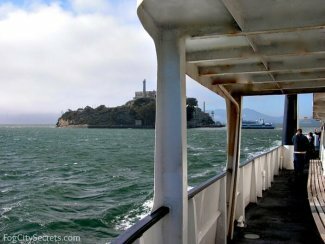 The Alcatraz ferries leave from Pier 33, about a ten minute walk from Fisherman's Wharf. The Blue and Gold Fleet ferries leave from Fisherman's Wharf at Pier 41. You can take the ferry to Sausalito and explore the seaside village, or take the ferry to Tiburon, another pretty town on the bay. The ferry to Angel Island leaves from here, too. (Plus the ferries to Oakland (Jack London Square), Alameda and Vallejo (Six Flags Discovery Kingdom). For info on what to do and see on Angel Island (that big island in the middle of the bay), see my page on Angel Island. Should you book the ferry in advance? No, you don't need reservations on the ferries. They don't fill up, and they have frequent departure times. 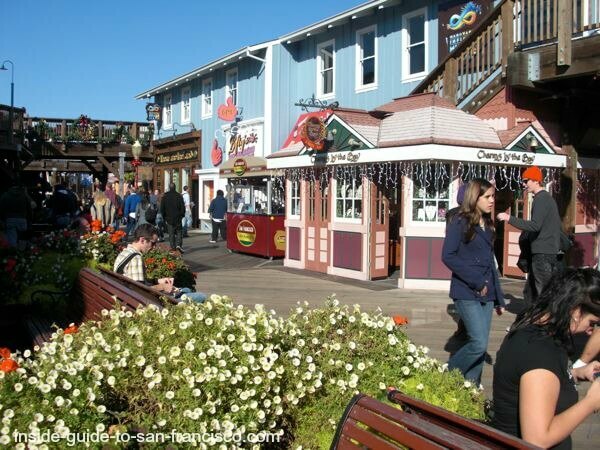 The Blue and Gold ticket booth on Fisherman's Wharf is just to the left of Pier 39. See Blue & Gold Fleet for schedules and fees. Pier 39, the last pier in the Fisherman's Wharf area, is a mecca for shopping, entertainment and eating, and the goofy sea lions are there. Created for visitors, it is touristy, but it's got lots to offer. I've spent many enjoyable hours there. 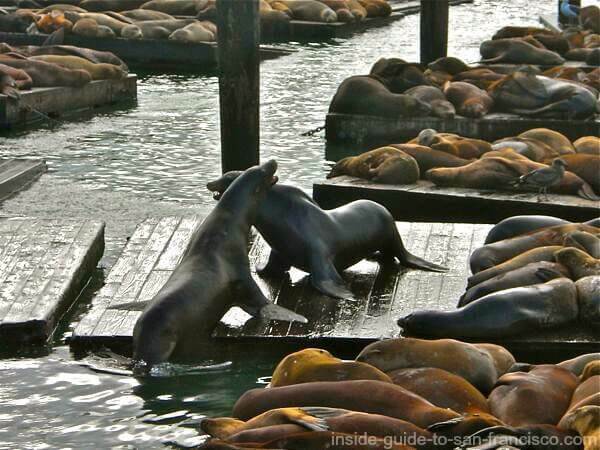 The sea lions have colonized the marina right next to Pier 39; get a close-up view of them lolling on the docks! 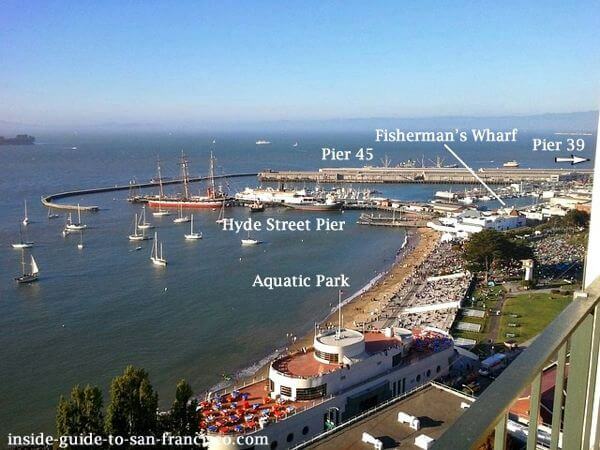 For tips on what to see and do there, see Pier 39. San Francisco's aquarium at Pier 39 focuses on the wildlife of SF Bay, the folks living just off the dock. 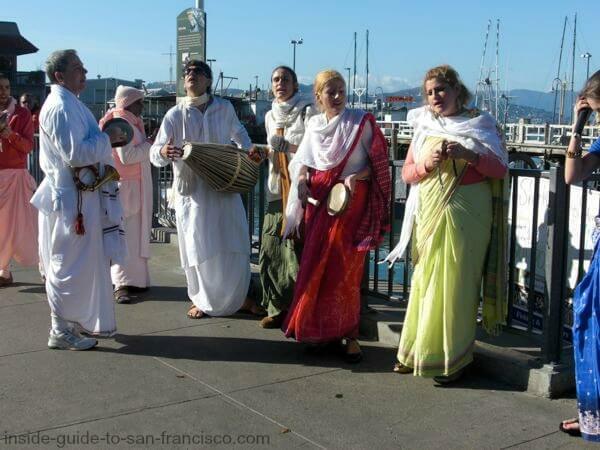 It's located at the entrance to Pier 39, and worth a visit. Small discount if booked online through City Sightseeing. 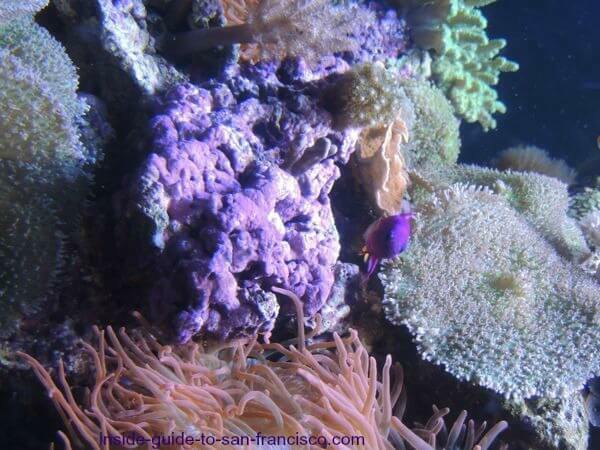 See Aquarium of the Bay for info and booking. Bay Area residents get an additional discount. See tickets for locals. We're not talking high-brow; this is the waterfront, after all. Museé Mechanique is my favorite. Over 100 vintage mechanical games from the turn of the century, and some familiar electronic arcade games from the 1980's; you can play them for a quarter. An amazing collection and lots of fun, located at Pier 45. 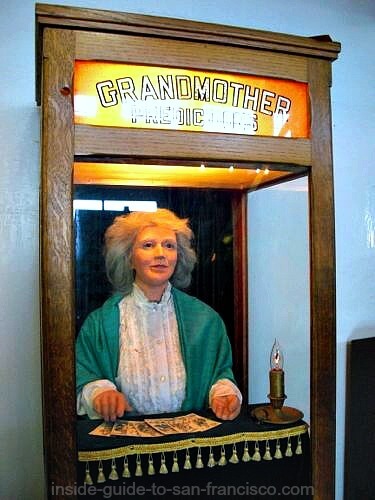 For all the details about the museum, see Museé Mechanique. The Dungeon is kind of fun, in a campy sort of way. It does give you an interesting glimpse into San Francisco's darker history. The acting is a bit hammy and the audience has to participate, but it's got some good scares in it. I wouldn't recommend it for younger children, both for the scare-you-in-the-dark aspect and some racy situations. It is definitely creepy. My 25-year-old son enjoyed it more than I did, and wants to go again; judging by the reviews, most people seem to enjoy it. You don't need advance reservations for these three, but you can get a better price by buying the tickets online. Get SF Dungeon tickets at $5 off the walk-in price at SF Dungeon tickets. You can also get a two-for-one deal, do both the SF Dungeon and Madame Tussauds, for the price of one of them at SF Dungeon/Wax Museum combo. 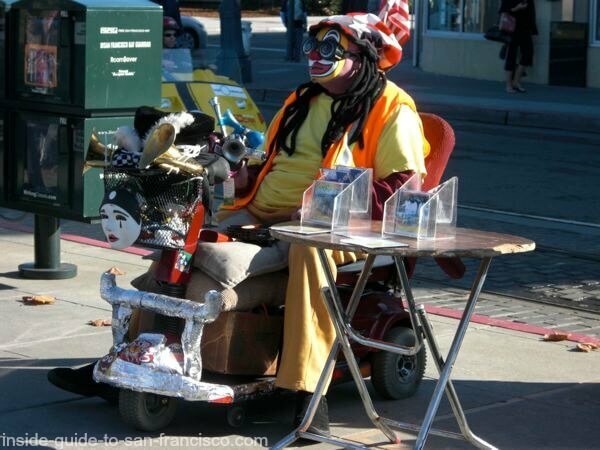 It wouldn't be San Francisco without some serious oddballs. 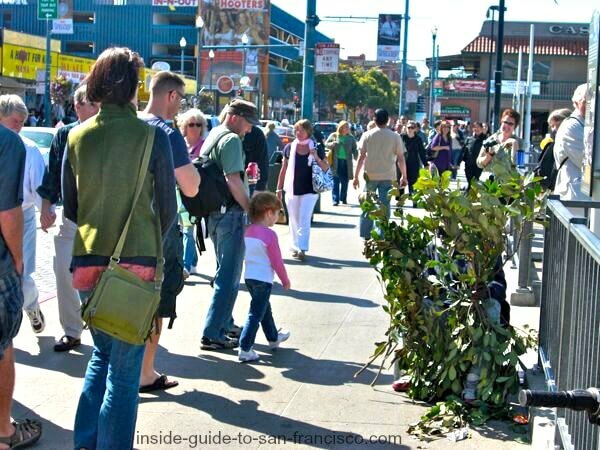 But the Bush Man is no longer hiding behind a bush at Fisherman's Wharf, scaring the passersby. A tradition of over 30 years has ended; now there's a Bubble Man blowing soap bubbles near the marina where the Bush Man used to hang out. There are two piers with historic ships you can climb around on for a modest entry price. At the western end of Fisherman's Wharf is the Hyde Street Pier, with it's row of vintage ships. The three-masted Schooner is an interesting one to explore; you can see it in the photo at the top of this page. 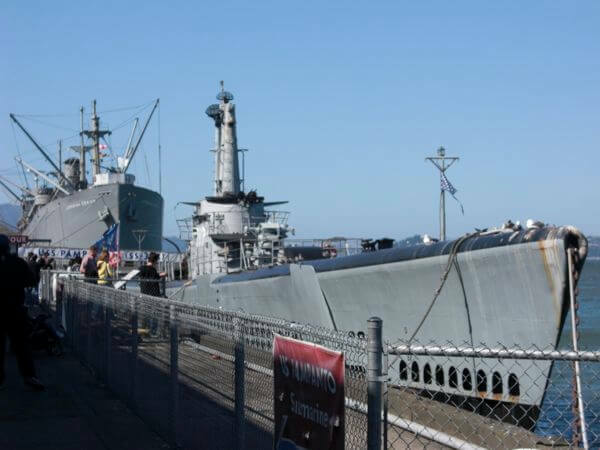 At Pier 45, two U.S. Navy ships used in World War II are open to the public. USS Pampanito: a submarine that saw action in the Pacific during WWII and is preserved with it's original furnishings. It's fascinating to crawl through the submarine and see the small quarters men lived in for weeks at a time. There's a good audio tour that takes you through it. SS Jeremiah O'Brien: one of the only two liberty ships still in existence. This ship was used in the filming of the Titanic. The scene with the water flooding the boiler room was shot on the ship. It's a huge ship and you can climb through all the levels. The SS Jeremiah O'Brien is still a functional ship. You can go sailing on the ship on one of it's periodic trips. They don't sail often, but it would be quite an experience. My friends made a trip on it and really enjoyed it. I've watched it sailing around the bay and under the Bay Bridge during Fleet Week. See their sailing schedule. A cool museum about the nautical past of San Francisco is located inside the retro-looking, white building next to the Aquatic Park beach, at the foot of Ghirardelli Square. Styled like a 1930's ocean liner, this building also contains a collection of beautiful, ocean-themed murals done by WPA artists during the Depression. Open daily, 10 to 4. Free admission. Some of the more active tours leave from Fisherman's Wharf, as well. The Go Cars, the little yellow cars with the self-guided GPS city tours, have a rental office here. Their other office for renting the cars is downtown. Having rented their cars at both locations, I can say it's a lot easier traffic-wise to do it from Fisherman's Wharf. You can read an account of what our two Go Car experiences were like. We tried out both routes (and did something kind of dumb...oops) but had a great time. I posted images of the Blue and Red Route maps, so you can see where they go (going down Lombard Street was great!). See my page on the Go Cars. For booking the Go Cars, go here. There are a couple of Segway tours leaving from Fisherman's Wharf that explore the waterfront and North Beach (which is right next door): a one hour tour and a two hour tour. There are a number of bike rental companies in Fisherman's Wharf. You can rent bikes to explore on your own, plus there are guided bike tours available that leave from the wharf. There are lots of places in the wharf area where you can rent bikes on a walk-in basis. But it's almost always cheaper to book them online, even if you do it on your phone right at the wharf. There's one company that has essentially free bike rentals (you get a voucher for the rental amount to spend at a big sporting goods store). See basicallyfree.com. This is the company I used for biking the bridge. One of the most popular things to do here is renting a bike and riding across the Golden Gate Bridge, then downhill to Sausalito. 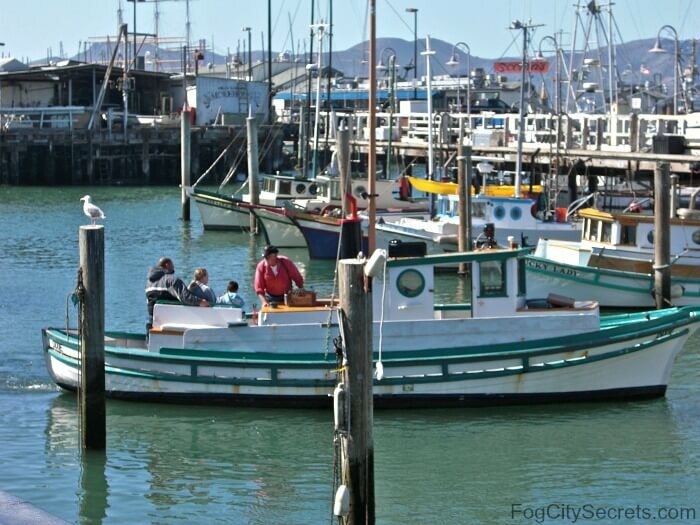 The Sausalito Ferry brings you back to Fisherman's Wharf. Gorgeous views, and a cute, seaside town to explore. You can also ride across the bridge and turn around and ride back, without going on to Sausalito. Bike over the bridge with a guide. You can have a guide take you from Fisherman's Wharf to the bridge, then across it and down into Sausalito. See guided bike tour for more info and booking. Bike to the bridge. For a shorter trip, it's also a lot of fun to ride from Fisherman's Wharf to the Golden Gate Bridge; great scenery and an incredible view of the bridge from Fort Point right below it. It's four miles, mostly flat, and takes about 30 minutes. Tips on bike rentals and tours. I researched the bike rentals and did the bike ride myself over the bridge and down in Sausalito. Highly recommended! Check out my guide to the best way to rent the bikes and what to expect on the ride, plus route maps and useful tips on taking the ferry back to the city, at biking the bridge. Also info on the guided bike tours over the bridge. Ghirardelli Square. Chocolate! plus more eating places and shops. Buena Vista Cafe. Famous for introducing Irish Coffee to the U.S. Hyde & Beach St.
Boudin Bakery. The original San Francisco sourdough, restaurant and tours. 160 Jefferson. Fort Mason. Art galleries, food festivals, museums and Friday night Off the Grid food truck gatherings. Just west of the wharf. International Spy Shop. Loads of secret gadgets, plus laser shooting gallery with a big screen. 555 Beach St. 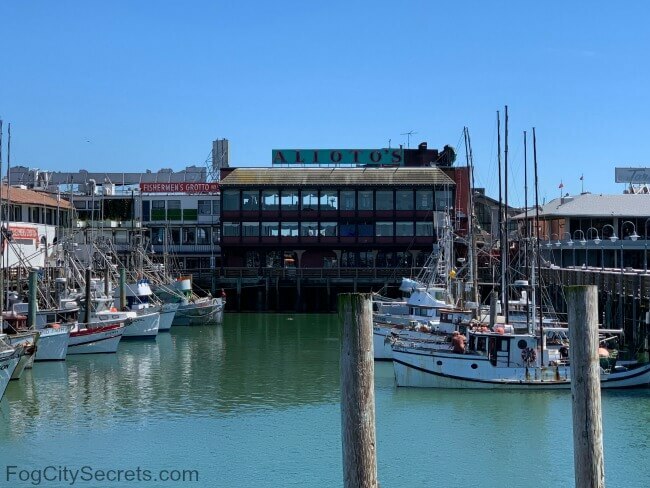 The attractions at Fisherman's Wharf can add up, but if you plan to see several things or go on various tours, you can save some money by using one of the passes. City Sightseeing has a 7-day pass that gives you a choice of 3, 4 or 5 activities and attractions. You can wait and choose them when you arrive to redeem the voucher. Also, you can start the pass at any time and it's good for 7 consecutive days. 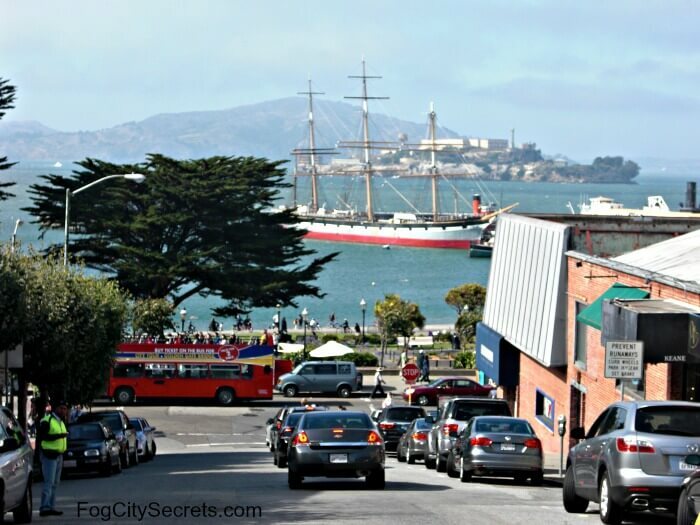 There are 25 attractions and tours to choose from, including lots of the Fisherman's Wharf activities: the Bay Cruise, Rocket Boat, Go Cars, bike rental, Aquarium of the Bay, San Francisco Dungeon, Madame Tussauds, 7D Experience, USS Pampanito submarine, Angel Island Ferry, and the Sausalito Ferry. Plus lots of other fun things like the Exploratorium, San Francisco Zoo, SF night tour, a cable car pass and the four major art museums. See Mega Pass for booking details. 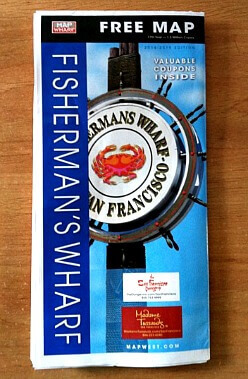 Here are some more passes that include Fisherman's Wharf and other SF activities. Takes a bit of wading through to look at all of these! If you are planning a city tour, the hop on hop off buses take you around to all the major SF attractions, providing transportation as well as an overview of San Francisco. Naturally, one of the stops on the route is at Fisherman's Wharf. The two-day pass is probably the best deal. It includes a city bus tour, a city night tour, and a tour to Sausalito, plus a walking tour, Madame Tussauds ticket, and some other things. $8 off if booked online. See Hop On Hop Off Bus Tour for more info and booking. It can be very convenient to stay near all the action and there's a cluster of hotels at Fisherman's Wharf to choose from. I think the one with the most charm is the Argonaut Hotel, located at the end of Jefferson Street near the cable car turnaround. It's close to everything, but at the quieter end of the wharf. The hotel is in an attractive brick building and has a nautical theme throughout it, and it's gotten high ratings in the reviews. See Argonaut Hotel for more info, reviews and booking, or browse the available San Francisco hotels. 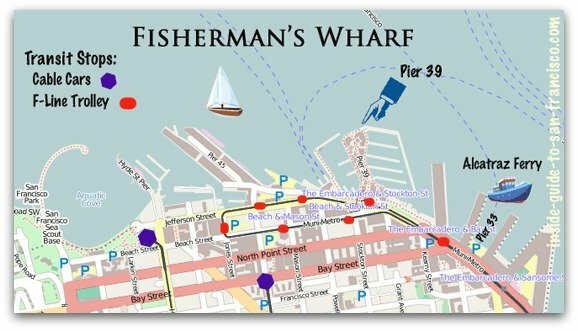 Fisherman's Wharf is very accessible via public transportation; given the parking situation, that may be the best way to come. Jefferson Street is where most of the action is. The F-line vintage street cars that run all along the surface of Market street through the downtown go all the way out to Fisherman's Wharf. There are several stops along Jefferson Street, starting at Pier 39. 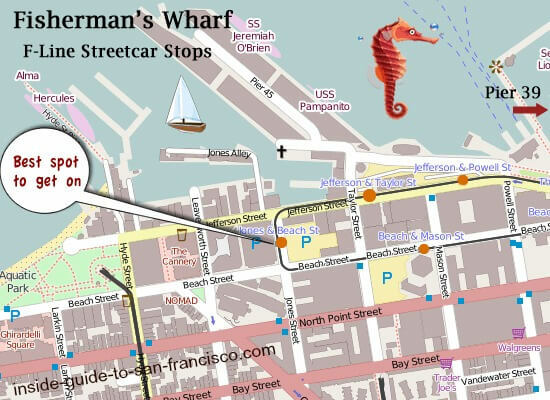 It takes about 15 minutes to get from from the end of Market Street (the Embarcadero stop) to Fisherman's Wharf. From Union Square you can walk down Powell Street to Market and catch it there. (Also see Map of F-Market Line and Bart Stations for the entire F-Line route). The F-line streetcars at Fisherman's Wharf can get extremely crowded, especially during the summer months. Leaving Fisherman's Wharf heading back towards Market Street or the Alcatraz Ferry? The stop at Jones Street just off Jefferson is the end of the line, and the beginning as well. Everyone has to get off there, then it pulls forward a little and people can get on. That's the best spot to catch the trolley. If you try and get on at a later stop, there is a good chance the tram will be full and you won't be able to get on, or at best you will be really jammed in. 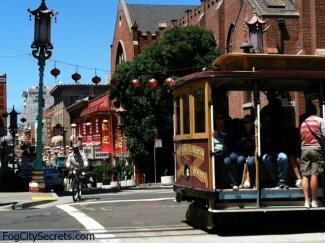 There are two cable car lines that end at Fisherman's Wharf. 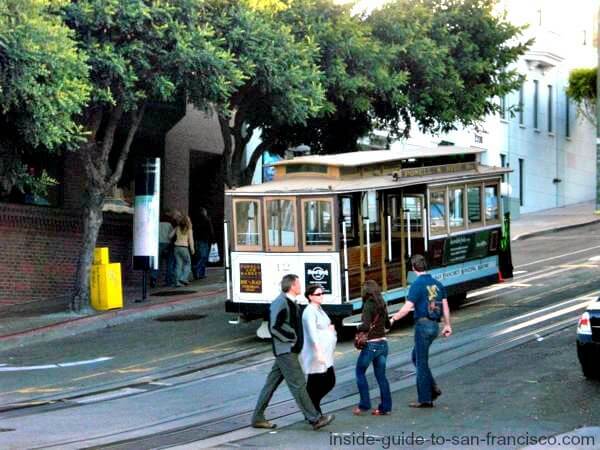 Both lines start at the cable car turnaround at Powell and Market. The Powell-Hyde line ends at Beach Street near Aquatic Park and the Buena Vista Cafe, and the Powell-Mason line ends on Bay Street, about three blocks above the wharf (see map above). 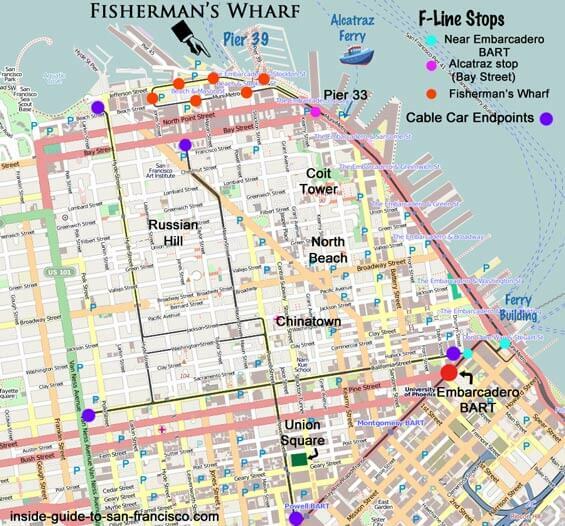 There are four bus lines (19, 30, 47 and 49) that go to Fisherman's Wharf from different spots on Market Street. See maps links below. If you want the complete transportation picture, check out the transit map for bus, streetcar, BART and cable car routes in the downtown and Fisherman's Wharf areas. You can download the map at Downtown Transportation Map. To check out the route for a specific bus, streetcar or cable car, including live info on where the buses are on the route, go to route maps. Click on the route, and you'll also see a live map showing where the buses are at the moment, and expected arrival times. Pretty cool! A very handy website for getting around on public transportation in the Bay Area is 511.org. See how to get from point A to point B on their trip planner. Just plug in your beginning and ending locations. Also, you can get all the bus schedules here. Note: SFMTA is the bus and streetcar system. If you are coming in on BART, it's easy to get to Fisherman's Wharf. Get off at any of the stops along Market Street (Embarcadero stop would be the most efficient), come up to the surface of Market Street and find the nearest trolley (F-line streetcar) stop. There's a streetcar stop at Embarcadero. Fare for adults on the F-line is $2.75, exact change required (unless you have a transit pass, Clipper Card or are using the MuniMobile app). For ages 5-18, and 65+, it's $1.35. For a complete guide to using public transportation in San Francisco, and the scoop on all the different travel passes, cards, and tickets, see my page on getting around SF. Driving to the wharf is pretty easy, but parking is a bear anywhere near this area. Forget street parking. There are several parking garages at the wharf; they are expensive, but the one next to Pier 39 does give one free hour with validation, as do the coupons available at Pier 39 (see the Pier 39 page for details). But is one hour enough? Probably not. There are also quite a few parking lots and garages a short walking distance away along the Embarcadero; see Embarcadero parking for a map and details. 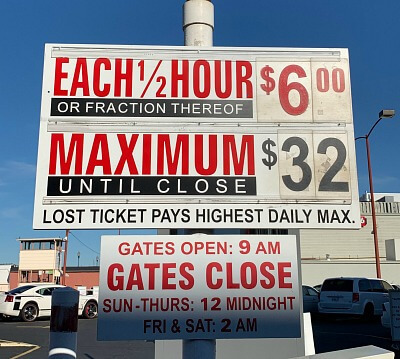 Parking in the lots and garages at Fisherman's Wharf can be very expensive if you just drive there with no reservation. Typical fees are $12 per hour and $32 per day! And they can fill up on busy days. Fortunately, there are better ways to do it. Parking tip #1: a parking app like Spot Hero is a handy tool that allows you to view the parking garages and lots near Fisherman's Wharf and reserve a guaranteed space ahead of time. You can check online for the best prices and availability, and not have to worry about the garage being full or paying an arm and leg once you get there. The Fisherman's Wharf area garages can fill up during the high season. I recently got a space via Spot Hero in a parking garage in the heart of Fisherman's Wharf and paid $9 for the whole day. Parking tip #2: park free at Fort Mason next door to the wharf (west side, towards the Golden Gate). Some are two-hour and others are four-hour spots. There aren't a lot of spaces, so it's sort of hit or miss, but sometimes it can work out. It's about a fifteen minute walk to the wharf. Entry on Bay Street near Van Ness Avenue. Parking tip #3: use the parking app Spot Angels to scout the area for street parking. The app also keeps track of where you parked your car, and can warn you when you are running out of the max time on the meter, or if a tow-away period is coming. But even with this, finding a spot on the street is tough in this area. Parking tip #4: A number of the restaurants at Fisherman's Wharf will validate parking at the Triangle Lot near the Fisherman's Wharf sign. They have a list at the parking lot with all the restaurants and activities that do validation and for how long. There are more than they show on the sign. The Triangle Lot address is 2817 Taylor Street. The #8 and #9 on the sign refer to the restaurant's address on the main square at the end of Taylor St.
Fisherman's Wharf Map: very-detailed map that shows the attractions, stores, hotels and transit stops. Bay City Guide: info on the attractions, restaurants and tours. 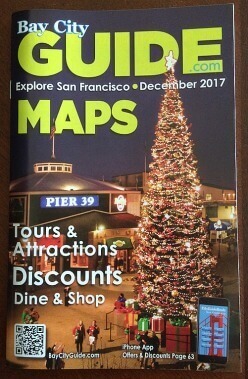 Plus maps of the city, Fisherman's Wharf, Union Square, Golden Gate Park, BART, F-line, and ferries. Also, both publications are full of coupons to save money on lots of the attractions and tours associated with Fisherman's Wharf (and beyond).